Gene Laverne was born in Saint Mathias, Minnesota, the oldest son of Dan and Aurora LaVergne. Gene's father was quite versatile, having been a sawmill worker, farmer and carpenter. His dad's roots go back to Alberta, Canada before moving to Minnesota. Gene wrote an email in June of 2004 that indicated music was "...in my blood." He related that he was about 8 or 9 years old when Dad brought home a radio, got it wired and hooked up. Between school and the radio, Gene was soon learning about the world. He recalls listening to radio station WJJD in Chicago, Illinois, then a 50,000 watt station - one Gene says "...became my beacon light day and night." Then, he heard the songs of such acts as the Cumberland Ridge Runners, Doc Hopkins, Mert Mennick and his fiddle, Carl and Harty, Randy Blake and others. 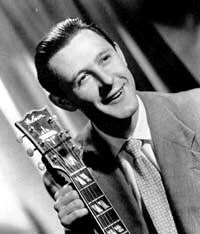 He notes that back then, he was able to listen to the WLS National Barn Dance, WCKY in Cincinnati, Ohio, WSM's Grand Ole Opry from Nashville, Radio Del Rio in Texas and the KWKH Louisiana Hayride. "It was all live country music. Live Music! That's the way radio was in the 1920s, 1930s and 1940s. Live people doing our roots of Country Music on the air." 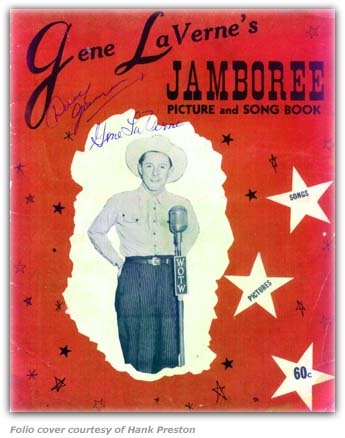 Gene LaVerne's Jamboree Picture and Song Book tells us a little more of Gene's early performing career. He found himself going to the local "Sunday-Go-Meetin" and "Saturday Night Shin Dig" affairs of the day as often as he could. It was at one of those Saturday night affairs that a gentleman by the name of Harry Burke saw Gene perform his act. Harry asked Gene to join him and thus, Gene was part of a vaudeville act known as Burke-LaVerne, even though he was only 13 years old at the time. Gene got to travel quite a bit on the theater circuit in those days. This lasted about four years. Gene then became a part of a traveling minstrel show that toured through the south and most of the Midwestern United States. But it wasn't until 1940, that "Cowboy" Gene LaVerne found himself in New England and embarked on a long radio career. However, almost as soon as he arrived, Uncle Sam tapped him on the shoulder and asked him to server during World War II, which he did until 1946. He returned after his tour of duty, and married the former Julie Barry, who herself was a top-notch entertainer. Gene found himself working clubs, some theater work, then went on as an act through McConkey Artists Corporation, a New York and Chicago Entertainment agency. Gene traveled the country for two years. In 1943, he teamed up with Jake Watts of the former Jake and Karl Country Radio Team. Later with Jake, he joined the Cactus Cowboys touring major cities in 1944 and 1945 with the rodeo-Col. Jim Eskews champion rodeo touring seasons. In 1945, Gene was appearing on a live country show broadcast over KXOK Radio, St. Louis, Mo. 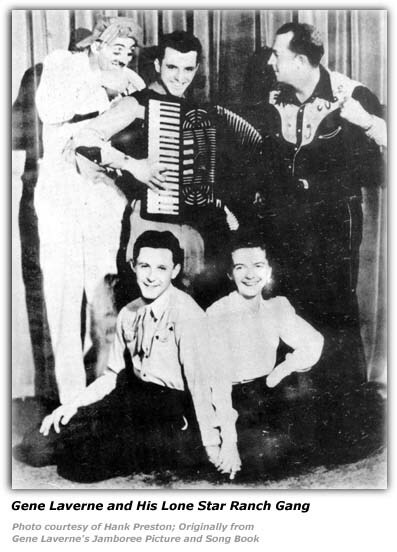 In 1946, Gene organized the Gene LaVerne Crazy Caravan radio group doing live country radio with personal appearance shows throughout New England. Gene and his band were heard over the following Massachusetts radio stations, WLAW, WACE, WOTW and WFEA in Manchester, New Hampshire. A 1946 article by Dusty Cal Witham tells us a bit about the folks that were a part of the Crazy Caravan. There was Joe Gallon, who was with Ken MacKenzie's group for a time. Carl Patrick played the steel guitar. Betty Gribbin was the other member at the time. 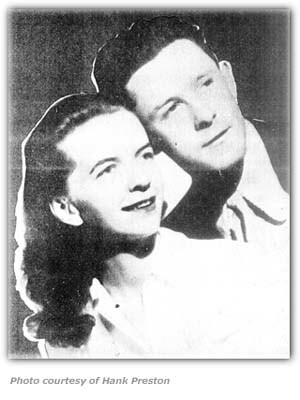 In the summer of 1946, Richard H. Keeler was reporting that Betty had left the group and was working at the C Bar C Ranch in North Windham, Maine. Bob "Slimmy Wimmy" De Wyngaert was playing the accordion. And on the fiddle was Moe Callahan. 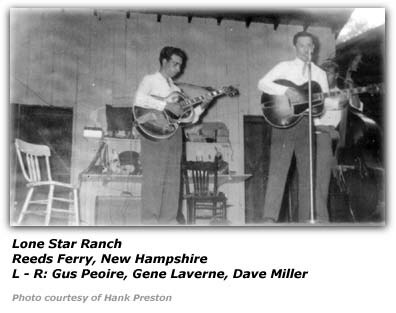 The summer of 1946 saw Gene take over operating the Lone Star Ranch, located in Reeds Ferry, New Hampshire. It might be good time to take a look back at this historical country music venue. In 1940, "Sagebrush" Jim Marshall and his band operated the ranch. In those early days, entertainers such as Elton Britt, Georgia Mae and other New England stars appeared on Sunday afternoons during the summer months. 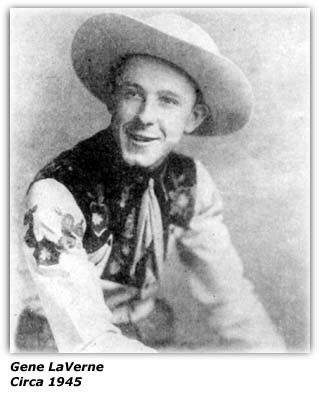 Jim featured acts from the Grand Ole Opry, as well as movie stars and other acts like the famed Hoosier Hot Shots and the Sons of the Pioneers. However, Jim died in a car accident. So, in 1942, Ken Lane and his band from Lynn, Massachusetts and Ken McKenzie from Portland, Maine helped keep the ranch open. In 1944, the Bar X Boys from Gardner, Massachusetts and the Circle C Boys and other outfits helped keep the ranch running and entertaining fans. However, the ranch closed during the summer of 1945 due to World War II. 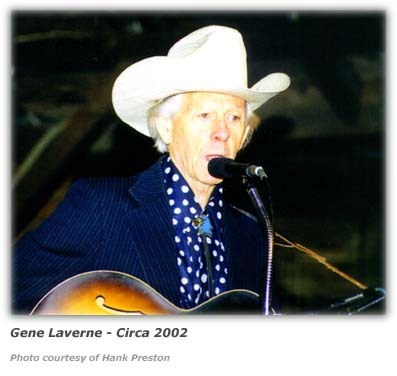 Gene LaVerne, a popular country music radio personality back then and entertainer then took charge of the ranch. His band was known as "The Lone Star Ranch Gang". Under Gene's guidance, the ranch grew in popularity. During that time, the ranch featured two shows plus an open jamboree show every Sunday afternoon. The ranch featured acts such as Roy Acuff, Kitty Wells, Ernest Tubb from WSM's Grand Ole Opry. From the WWVA Jamboree in Wheeling, WV, it featured such stars as Yodeling Kenny Roberts, Doc and Chickie Williams, Dusty Owens, Yodeling Slim Clarke. The ranch also featured such local acts as Dwight Davis and the Linemen, Dave Miller, Doug Garron, Clyde Joy and his band. The years went by and in 1956, Buzz Whittaker purchased the ranch and continued to offer shows that featured top country acts of the day. In 1983, Buzz announced that he could no longer continue to keep the ranch open. 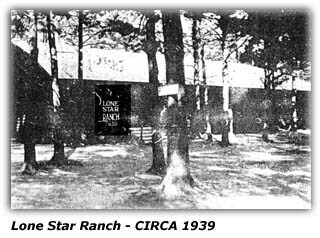 The Lone Star Ranch in Reeds Ferry, New Hampshire closed in October 1983. 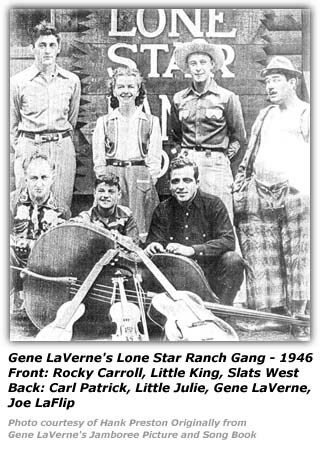 Gene and his Lone Star Ranch Gang operated the Lone Star Ranch for 12 years. Gene brought in famous country acts from the Grand Ole Opry and also from the WWVA Jamboree, Wheeling, West Virginia. He also featured local area bands. One of the highlights of the Shows held every Sunday afternoon during the summer was the Jamboree Portion of the show. Here Gene would allow local talent to appear and gave them the opportunity to appear on stage with big-name artists and also get exposure of their talent. Gene opened the shows with his Lone Star Ranch Gang and also served as the MC of the show. In a "What's New in New England" column in July of 1947, we learned that Gene and his gang were up bright and early, doing a 6:15am show over WLAW in Lawrence, Massachusetts. In early 1947, Gene's group underwent more personnel changes. Performing with the group at that time was Rocky Carroll, fiddle. Little Julie was in the role of the female singer for the group. And Joe La Flip, a 'French Dialect comic' as he was described. The summer of July 1949 saw another change. The group was then called the "Wildcats" and they were being heard over radio station WACE in Chicopee, Massachusetts. In 1954, Gene joined WFEA Radio, Manchester, New Hampshire full time. In 1966, he went to WFGL and WFMP-FM in Fitchburg, Mass. While at this station, he established a country format and did a four hour daily block of country music. He also became the Program Director and Account Executive. For many years, WFGL and WFMP-FM were rated as the Number One country station. In 1973, won an award as Best Regional DJ from the ESCM (Eastern State Country Music). He was again cited as King DJ in 1976. In 1979, he was honored as DJ of the year by the Massachusetts Country Music Association. For 28 years, Gene organized and flew to Nashville "FanFair Tour groups," providing New Englanders with the opportunity to attend this special event. Currently, Gene is still entertaining. He appears yearly at the Deerfield, New Hampshire fair and also appeared in 2003 at the Cheshire Fair in Keene, New Hampshire. He also does private show dates. "... when our forefathers came to America, then a new land, they sought a new beginning and they brought with them not only their precious belongings, dreams, but also their music. They continued to immigrate to this new land in droves from the early 1800s to 1950 and still more come today. The people in those early days of migration came from Ireland, France, Scotland, Germany and settled in the east, the midwest, the mountains, the hills of Virginia, Kentucky, Tennessee, the Ozarks and migrated even farther to California. Along the way, a new invention allowed the recording of music and record they did - on the early vinyl 78s to the later 45rpms, the long playing albums to 8-tracks and cassettes to today's CDs. That music became American Music. It was a powerful American sound, a mixture of Gospel, Blues, Black Music, Blue Grass and original Country Music. The roots of American and Country Music. It is and was the way the country has grown. The country went from candlelight to lanterns to electricity to modern day lighting. The country went from walking to riding horses and mules, from wagons to the automobile. Then it was trucks, busses, trains and planes. From live music to recordings, to television, from the old fashioned telephone to a handsome new wireless hand held phone that takes Photo's, too! And now, Gene notes we are on the threshold of unbelievable breakthroughs in Fiber Optics, the unbelievable growth in the health and medical fields, in genetics, longevity and in a growing vision of things that are still all unknown and unseen. "And from my life, of the basic world of Country Music, to an unimaginable world yet to be shown...I'll be hoping I have a good seat to watch it all!" Hillbilly-Music.com wishes to express its appreciation to Paul "Hank" Preston for providing this outline of Gene's career.